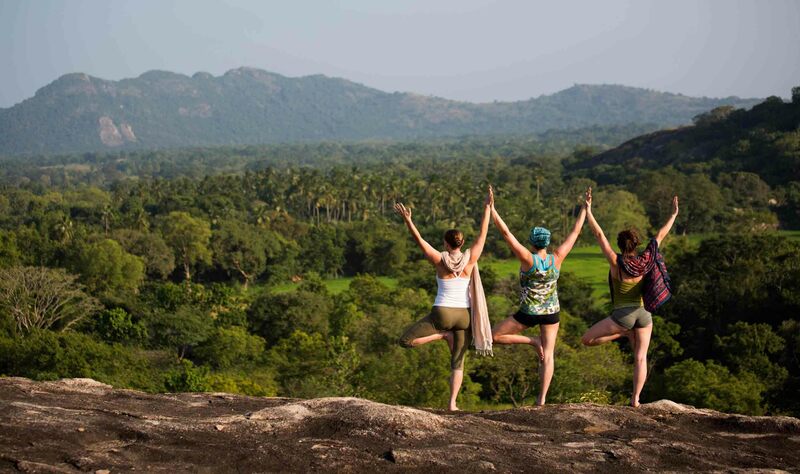 Following a week-long retreat at the Sri Lankan eco-village of Ulpotha to escape the pressures of civilization, Rory Spowers [our writer] emerged cleansed and with a renewed sense of inner peace. The time has come to embrace – dare I say it – your ‘inner child’. Life at this Sri Lankan Neverland is as simple and carefree as a kid’s. Whether you’re frolicking on the freshwater lake, or climbing the hills and finding caves, Ulpotha encourages that joyful sense of wonder so frequently denied by modern lifestyles. It’s bare and innocent, exotic and playful. Few places can boast of such a subtle fusion of sybaritic indulgence and raw, ascetic comfort. Just when you feel the need for something – a drink, food to nibble on, a place to lounge beneath a majestic banyan tree – it miraculously appears, as if your every thought has been predetermined. Life here just flows, effortlessly. To begin with, the transition from the urban West to a rural village in Asia proved quite a shock. Living without electricity, in an open-sided mud hut, eating bizarre-looking local dishes and detoxing from a diet of strong espressos made me feel more than a little displaced. For some of my fellow visitors, these first two days were a bumpy ride, the jet lag combining with the shift in space-time to leave them looking a little bewildered. Hell, even the light seemed to be different. But once we adjusted to the pace of Ulpotha life, none of us ever wanted to leave. The village is Spartan but sophisticated; basic but opulent; bare but beautiful. I started my days with some yoga in the breezy open pavilion. Ulpotha draws a steady stream of world-class teachers of all persuasions, from gentle Hatha to fluid, invigorating Ashtanga. All students are accommodated, from the novice to the adept. The vibe at Ulpotha precludes any sense of exclusion, so even if you never navel-gazed or ‘saluted the sun’, do not be put off. The teachers set their own schedules, usually offering a class in the morning and again in the late afternoon. As with everything at Ulpotha, from meals to those indulgent daily massages and pamperings at the ayurvedic spa, yoga is part of the all-inclusive rate of your stay, so just take advantage when you wish. Nobody’s going to raise an eyebrow should decide to stay in bed or lounge in a hammock rather than work on your downward dog. Breakfast is a relaxed come-and-go affair at the village kade (stall). Drink a mug of freshly brewed tea, feast on bananas that actually taste like bananas, or try rolled pancakes stuffed with coconut and jaggery,, the brown sugar derived from the kitul palm. I developed a passion for kola kanda, which looks like some science-fiction milk shake to guarantee superhuman strength, but is in a fact a green-rice porridge made with gotu-kola, a herb renowned for its anti-ageing properties and numerous health benefits. Suitably stoked by my start to the day, I wandered down the swept dusty paths to the wedegedera, or ayurvedic spa. During my free consultation, Dr. Srilal, the resident ayurvedic physician, determined my body type, or dosha, then prescribed an appropriate diet and suggested possible courses of treatment for my stay. These packages are individually tailored to your needs and constitute the only extra cost to your stay, should you opt to take them. A minimum of one week is required, while the more involved programmes may require up to a month for their proper application. Traditional detoxification therapies range from soothing herbal baths and oil massages, to being steamed with herbs and spices inside a giant wicker basket. The fact that this looks like a torture chamber from a Bond film, and comprises a coffin that encloses the body and streams you with herbs heated in boiling clay pots below, should not cause alarm as it’s quite safe and perfectly pleasant. Some of the elimination therapies, on the other hand, are not for the faint-hearted, involving enemas and enforced vomiting. You have been warned. Lunch and dinner are served in the ambalama (rest pavilion) at the heart of Ulpotha. A stunningly diverse assortment of exquisite curries, all served in clay bowls, are beautifully arrayed on one huge woven mat. Rare red rice strains combine with delicate spicing of pulses and vegetables, all grown at Ulpotha and washed down with ayurvedic teas or the medicinal juice made from the extraordinary wood apple. You will never have eaten meals like this, anywhere, ever. The ambalama also provides the focal point for the Ulpotha community, where guests converge for food, for conversation, or just to relax with a book on the sumptuous cushions and absorb the heady tranquility that pervades life here. I soon felt like whole weeks had drifted by, entranced by passing butterflies during the day and fireflies flashing at night. Physical activity is by no means restricted to yoga. Every day I went swimming and boating in the vast freshwater tank, surrounded by water lilies and iridescent dragonflies. On the far side, waterways disappear into overhanging jungle and expeditions can feel like an Amazonian adventure. I hiked the jungle trails to the Ulpotha, or spring, that gives the location its name, and others went to visit practicing shamans and ascetic monks in the local caves and temples that dot the hillsides. There is always the option to take a bicycle to the nearby village, or to venture farther afield on day-trips to ancient sites. Most of us preferred to stay anchored to Ulpotha, the combination of the Ambalama, the tank and on-tap massages proving too addictive to part with. A steady flow of western practitioners passes through over the two seasons, adding acupuncture, reflexology and other treatments to the repertoire, beyond pure ayurveda. Again, none of these requires dipping into your pocket so, in addition to media, electricity and cappuccinos, you can forget about money for a while. If this sounds too virtuous and worthy for you, feel free to crack open your bottle of duty-free scotch or wine and dance all night, to sounds provided by local musicians and twinkling lights by nature. Ulpotha is not an ashram. It’s about letting go, having fun and unleashing the Peter Pan that lurks within us all. Ulpotha is hard to fault. All staff are local, the organic food is grown on site and the village is self-reliant on water. There is no power, all waste is recycled and net carbon footprint is virtually zero. The ayurvedic clinic provides a free service to surrounding villagers, and rehabilitation of the watershed has transformed the lives of thousands of people who depend on it. To sum up, Ulpotha has no electricity or mod cons, and maintains an intelligent use of natural resources.